I described my approach to dealing with these problems in an e-book titled We Can do It!, published it in June 2013 (no longer available). 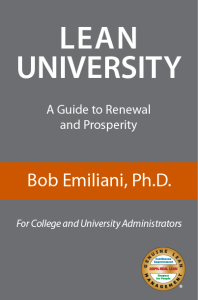 The paperback edition, Lean University, was published in June 2015 and contains new and updated material. Lean University educates university leaders on a practical, alternative approach for improving how to lead and manage higher education institutions. It is an approach that has worked very well in other organizations where leaders were willing to learn new ways of thinking and doing things, and to lead others by demonstrating what they have learned though daily practice. Lean University informs university leaders, from department chairs to president and board members, of the purpose and rationale of Lean management and how it is a management system as well suited for higher education as it is for hospitals or manufacturing businesses. It offers a better and clearer vision for meeting the needs of students, payers, and other key stakeholders.